Some things in life practically scream luxury, like the hundreds of crystal chandeliers adorning the rooms of the renowned Emirates Palace in Abu Dhabi. But it’s one thing to look luxurious; it’s another thing entirely to feel like luxury — which is likely why metal credit cards have gained such popularity. Once reserved for the wealthiest cardholders, today’s market is full of metallurgic marvels of all rewards types, offering everything from travel rewards to hotel points and slews of perks designed to bring a little luxury into your life. Although all of our metal card options will provide rewards for everyday shopping, many of the best ore-laden payment cards are designed with the busy traveler in mind. Not only do these top travel credit cards come with flexible travel rewards, but each has a metal-alloy composition that gives them that luxury feel. Don’t worry about airport security, though; reports indicate these cards shouldn’t set off the usual metal detectors. One of the newest cards to get a metal makeover, the Capital One® Venture® Rewards Credit Card is 16 grams of flexible-rewards fun. It seems only new cardholders are given the metal version of the card, however, so you may not receive metal if you renew your existing card. Weighing a full 13 grams, the Chase Sapphire Reserve® was one of the first metal credit cards available without an invitation. Beyond its composition, the card’s high rewards rates, annual travel credits, and network of transfer partners all make it a worthwhile pick for regular travelers. The lower-cost sibling of the Chase Sapphire Reserve®, the Chase Sapphire Preferred® Card has less than a quarter of the annual fee but the same 13-gram metallic composition as its big sibling. Plus, cardholders still earn the flexible Ultimate Rewards® points on every purchase. While many of us will save up so we can splurge on luxury while on vacation, wouldn’t it be lovely to have a little bit of luxury every day? With the right credit card in your wallet, you can turn every grocery and drug store purchase into a great excuse to indulge in the luxury feel of a sleek metal credit card. Who says errands have to be boring? Just make sure your new points card has more going for it than mass — especially if it carries a big annual fee. Pick a card with rewards that fit your spending habits and lifestyle to help justify keeping the weighty wonder in your wallet. This card is a metal-plastic hybrid that has a more significant weight and feel than your typical all-plastic credit card. And with triple points on travel, dining, and select streaming services, this card has the substance to back up its metallic style. 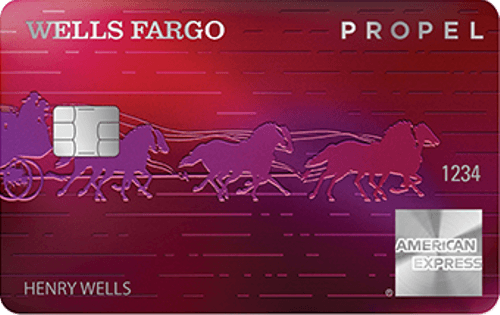 The Platinum Card® from American Express has a metallic finish and an 18-gram heft that give the card much of the look and feel of its namesake metal. As with many of the elite cards on our list, the Platinum Card’s purchase rewards are only a portion of the card’s appeal. It also comes with annual credits, elite status benefits, and a range of other perks. The semi-exclusive U.S. Bank Altitude™ Reserve Visa Infinite® Card won’t require an invitation, but you’ll need to be a U.S. Bank customer to apply. While not a card with a high shine finish, it’s one of the heavier metal cards on the market at 16 grams. The Altitude Reserve is a Visa Infinite card, so cardholders can access a range of Visa Infinite benefits, including exclusive airfare discounts. Exploring the current range of metal credit cards, it can be easy to succumb to the sticker shock their annual fees can incite. 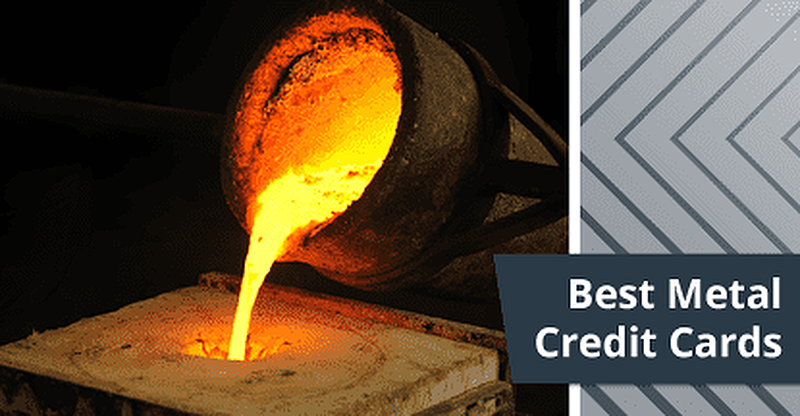 But you don’t need to take on a big annual fee to enjoy the benefits of a metal credit card. That being said, your options for annual-fee-free metal cards are definitely limited — to a single card, in fact. But that one card can pack a lot of value for those who can make the most of its rewards. The Amazon Rewards Visa Signature® Card — or the Amazon Prime Rewards Visa Signature Card, if you have a Prime Membership — comes in at 13 grams and is the only no-annual-fee card sporting a metallic composition. The points earned with an Amazon Visa card can be redeemed for travel, gift cards, or a statement credit, as well as redeemed directly at checkout for Amazon purchases. For the brand loyalist, the hotel or airline co-branded credit card can hold significant value — and not just as an easy way to score free stays or flights. Co-branded credit cards also typically offer exclusive perks and lucrative benefits, including things like free room upgrades or free checked bags on flights. So, how do you take an exclusive credit card to the next level? Why, you make it metal, of course. One of the heaviest metal credit cards on the market, the 28-gram Ritz-Carlton Rewards® Credit Card definitely makes an impression worthy of the brand’s luxury image. 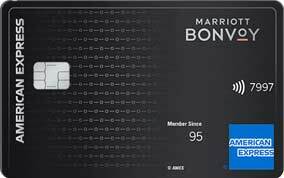 The Marriott Bonvoy Brilliant American Express® Card is the rebranded program’s top-tier rewards card. The card offers the same 6X points on Marriott Bonvoy purchases as its less expensive sibling, plus 3X points at U.S. restaurants and on airfare purchased directly from the airline. Cardholders can also enjoy complimentary Gold Elite status at Marriott Bonvoy properties, an annual $300 Marriott Bonvoy statement credit for eligible property purchases, and a free night award each year after the cardholder anniversary. Another metallic card issued by Chase, the United MileagePlus® Club Card is currently the only airline co-branded metal card. Coming in at just 12 grams, it’s fairly light for a metal card, though the card still has more than twice the weight of a regular plastic card. While the United MileagePlus® Club Card’s earnings rate is surely a big draw for cardholders, it’s likely the accompanying United Club membership that appeals to regular United flyers. Of course, no list of metal credit cards would be complete with the exclusive and elite cards that started it all. Not only are a couple of these cards invitation-only beauties that inspire envy by name alone, but the cards below are also made with luxury metals like titanium, gold, and palladium. The quintessential elite credit card, the Centurion® Card from American Express is known the world over as the Black Card. Reportedly the very first of the modern metal credit cards, the Centurion® Card is made of anodized titanium and weighs a whopping 14 grams. While the points earned with a Centurion® Card are alright, the card is packed with other perks, including elite status with Marriott , Hilton, IHG, and Relais & Châteaux 5C. At 22 grams, the Barclays-backed Luxury Card Mastercard® Gold Card has a hefty composition — and an equally hefty annual fee. For just $995 a year, you can swipe a card made with 24-carat gold. In addition to purchase rewards, the Luxury Card Mastercard® Gold Card comes with a variety of benefits, including 24/7 access to the Luxury Card Concierge, global luggage delivery, and no foreign transaction fees. The invite-only J.P. Morgan Reserve is an elite credit card reportedly only available to J.P. Morgan Price Bank clients. The card, originally called the J.P. Morgan Palladium, is made of brass and palladium and comes in at 27 grams. If the rewards offered by the J.P. Morgan Reserve look familiar, it’s because they likely are; the card’s features are nearly identical to the mainstream Chase Sapphire Reserve® — which is also available in metal. Although luxury can very much be in the eye of the beholder, some things are universally fancy, like crystal chandeliers, marble showers — and metal credit cards. Unfortunately, for all their appeal, metal credit cards do have one downside: destroying them. Given their metallic natures, these cards can be a bit of a pain to dispose of when they expire. The tried-and-true method of “bend it back and forth until it snaps” is unlikely to work with one of these metallurgic masterpieces. The Platinum Card, for example, can only be bent 0.3 centimeters. So, how to get rid of your old metal credit card? Well, you could always get crafty and upcycle your card with a fun project. Or you can take the simple route and simply contact your issuer; most will happily dispose of your old metal card for free.